A thriller about a mother and her four-year-old son who, during an afternoon trip to the zoo, find themselves caught up in a mass shooting. ...[an] expertly made thriller ... Part of the book’s great allure is that the reader feels as if this character, Joan, is working out each of her dilemmas in real time ... Our full visibility into Joan’s moment-to-moment reasoning is also what makes this novel so clever and irresistible. 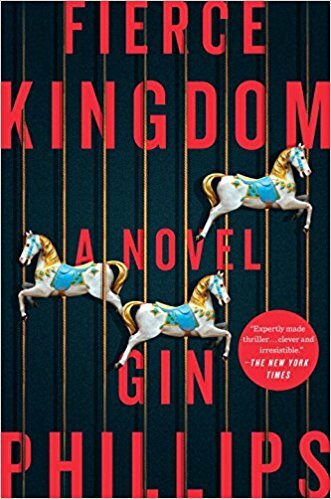 Fierce Kingdom is a portrait of a mind at work under macabre duress ... before Lincoln’s chatter is grating, it is endearing, and we never find him grating as a character; we fret about his safety from start to finish. Joan’s desire to protect him is total, feral Fierce Kingdom is a diabolical enactment of a mother’s most tortured and catastrophic thoughts. One of the more astonishing things about Fierce Kingdom is how firmly it is a novel about parenthood ... Fierce Kingdom explores how entwined violence is in the ordinary, and how for the young, it can be a safe abstraction, or cruelly real ... Because we make fun of helicopter parents for the lengths they go to to keep perfectly safe children even safer, we can can forget that, for children, safety is a kind of love — and that makes Fierce Kingdom a terrifying book, but more importantly, a beautiful one. Joan’s inner monologue provides the bulk of the narration, her thoughts a rolling storm of tangents that relate history and inform motivation while governing pace and tone. Phillips’ characters are exquisitely rendered, her prose is artful and evocative, and the restraint she practices with regard to on-screen carnage grants weight to every shot fired and corpse discovered. Poignant and profound, this adrenaline-fueled thriller will shatter readers like a bullet through bone. What did you think of Fierce Kingdom?